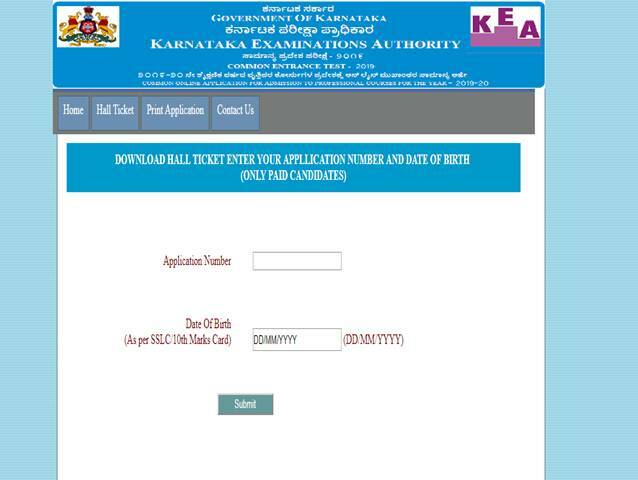 KCET Hall Ticket 2019: Karnataka Examination Authority (KEA) has released the hall ticket of Karnataka CET (KCET) 2019. Candidates can download the hall ticket for the Common Entrance Test from the official website. Candidates who have applied for the examination can download the hall ticket using their login credentials. The hall ticket will contain all the important information related to the examination. The entrance test will be conducted on April 29 and 30, 2019. The examination will be held in two shifts. Candidates appearing for the examination must check the shift timing given on the hall ticket. The hall ticket will contain the candidates’ details such as name, gender, category, photograph, and signature. The hall ticket will also contain information about the examination centre like the name and address, subjects appearing for, the shift of the examination, reporting time of the examination. Candidates are advised to read through the examination instructions carefully. Karnataka CET 2019 is held for the admission to the Engineering, Technology and B.Pharm programmes along with the admissions to the second year B.Pharm, Pharm. D, Agriculture courses (Farm Science), and Veterinary courses in Government/ Private/Aided / Private Un-aided Professional Educational Institutions in the state of Karnataka. The examination will be held in two shifts which are 10.30 AM to 11.50 AM and 2.30 PM to 3.50 PM on both the days of the examination. The Kannada language test, however, will be held on May 1, 2019, from 11.30 AM to 12.30 PM.